Alberta’s Cowboy Trail is legendary for its history and heritage. Never mind that it’s also a gorgeous winding slice of highway that skirts the eastern slopes of Alberta’s Rockies. And when it comes to fueling road trippers, these five places along Highway 22 – with its distinct yellow-and-black signposts – are where the beef and barley (as in beer) pair up perfectly. Here are five to dial into your GPS. And you’re certain to run into a few local characters along the way. Cowboy cuisine is a real thing. 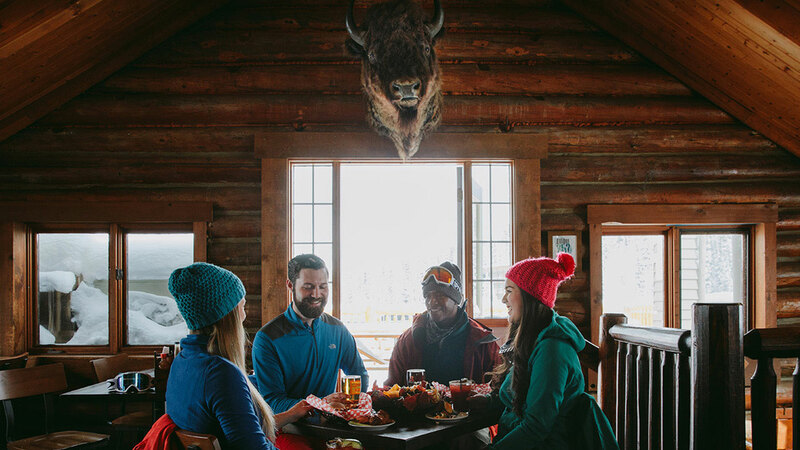 You’ll get a full belly and a side order of Alberta’s colourful ranching past at the historic Bar U Ranch. Beef and bison have always been the mainstays of hard-working ranchers and the Bar U restaurant menu keeps up that tasty tradition. Western beef-forward dishes are served in the restaurant: chili, burgers and roast beef. Meat not your jam? There’s plenty to choose from. 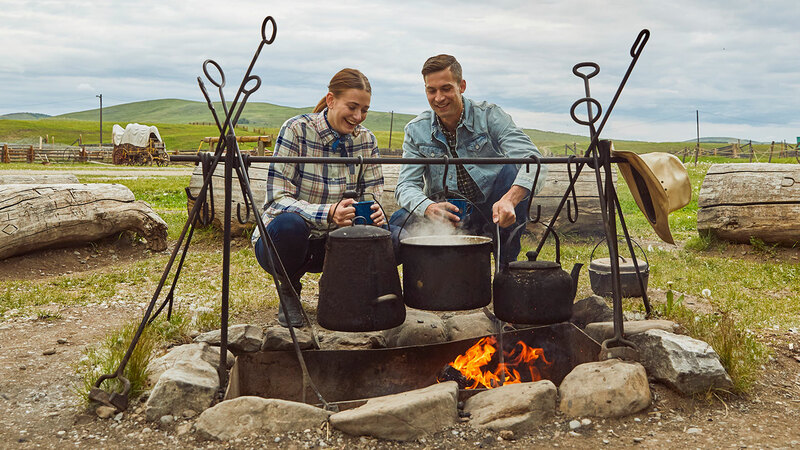 The carb and protein fill-up will give you the drive to perhaps learn how to rope a calf (don’t worry, it’s not a real one) or hear tales of the tough-as-nails cowboys from Alberta’s past over a strong, hot cuppa cowboy coffee around the campfire. FYI: They don’t serve beer here, but they do grow the barley for Alberta’s first whiskey distillery, Eau Claire, just 30 minutes to the north in Turner Valley. It’s another must-stop visit along the Cowboy Trail. You don’t really need to ride a motorcycle to stop here – although it may look that way from the parking lot jammed with two-wheeled iron out front of the Twin Cities Hotel. Trust us, it’s not a rough-and-tumble kind of place. But there are stories from back in the day. The locally owned and historic hotel in Longview has been around since the oil-and-gas-boom days of the early 1930s. (That explains the old wooden oil derrick out front). It’s always been a place to relax and hang your hard hat or motorcycle helmet. But what about that name – Twin Cities? Longview was once called Little New York and its sister hamlet Little Chicago became the ranches you see from the road today. The patrons, a friendly mix of locals and out-of-towners, are as eclectic as the menu. The Little New York beef burger is a deliciously messy handful. But if beef’s not your thing, they’ve got you covered with other choices. And, like the oil underground, the taps are always flowing with local craft beer. The Westwood was such a popular food trailer that it couldn’t help but grow into a full-sized restaurant, now located across the street from its former parking spot. Owner Erin Kendrick, an Aussie transplant, has turned casual food into a creatively delicious art form. That’s right down to the Mushy Burger – a savoury concoction using locally grown mushrooms. You know a place is near and dear to locals when the patio out back is filled with them – on a Monday for lunch. Of course, they come back for the local music that Kendrick brings in a couple of times a month and the fresh pour-it-yourself coffee and sweet home baking. Everything is as local as possible – save for the out-of-this-world, deep-fried avocado, a natural side order to the bison, beef or the lamb burger. Pours are a rotating roundup of beers, like the Burmis Tree, made by Six Corners Brew Works in Okotoks, just a stone’s throw down the highway. Just like in life, who hasn’t had a few hard knocks?” These true words come from Pam Lyken, who along with her brother Cory are behind Black Diamond’s Hard Knox Brewery. With roots in the area, the pair set out to pay homage to the hard-toiling miners and ranchers of Southern Alberta. (While you’re there, stop to admire the artful metal tap pulls carved in the shape of miners.) The name is also a nod to their master brewer Isaac Privett, who hails from Knoxville, Tennessee. He and his wife now call Black Diamond home. Sip on a flight of Dusty Trail, a dry hoppy American IPA, or Grunt Work, a malty Vienna-style beer. Then raise a glass to the hard-working miners and ranchers whose pictures hang on the walls of the tap room from days gone by. Hard Knox doesn’t have a full menu, but you’ll be satisfied with their salty snacks – European soft pretzels, hot dogs and beer nuts – that are a perfect match with their beers. You can also order in from several local restaurants or bring your own grub. They don’t mind; they just want you to sit back and relax and savour the fruits of their hard labour. If this place had been around, oh about a century ago, you might have tied your horse up out front. But these days, just pull your car into the parking lot or walk in from downtown Cochrane’s main drag. Looking like a weathered metal-roofed barn from back in the day, Half Hitch plays up to the town’s ranching roots with a multi-generation modern-day family running the operation. The horseshoe-shaped bar is the choice spot to relax and pick from 12 taps of locally made beer. You’ll always find a half a dozen or so of Half Hitch’s flowing, but also many other choices from Alberta’s ever-expanding beer scene. It’s how they like to operate, community-forward, sharing the hop-filled love from across the province. If you’re not a beer connoisseur, no problem. Choose your sips based on the cheeky names of their beers, like Papa Bear, Shotgun Wedding and Farmer’s Daughter, which all come with a tall tale that’ll make you smile. The menu reads like something you’d might find at a Sunday barbecue out in the country and much of it is in collaboration with their neighbours. Like the Community Collaboration Burger, where $2 from every burger that’s ordered goes to a local charity. It’s down-home goodness done in a sincerely fun manner.